Forget the mint on the pillow. At this hotel, there is no pillow, blanket or bed. If you're lucky, you stay just once at the $10-a-night Faktum Hotel, where guests experience life in Gothenburg, Sweden, as a homeless person. If you're unlucky, you're actually homeless, and sleeping every night under a bridge -- one of the many options at the Faktum. With harsh winter weather, however, most of the customers check in via virtual reality. And while it might not seem like you're getting a lot for your $10, that money is going to a a good cause -- and it's raising awareness. “We’ve had a very cold season in January and February. It’s a time when people take matters like this more serious,” Faktum editor-in-chief, Aaron Israelson said. All hotel profits are used to support the charity works of Faktum Magazine, a street magazine in Sweden, sold by the homeless. 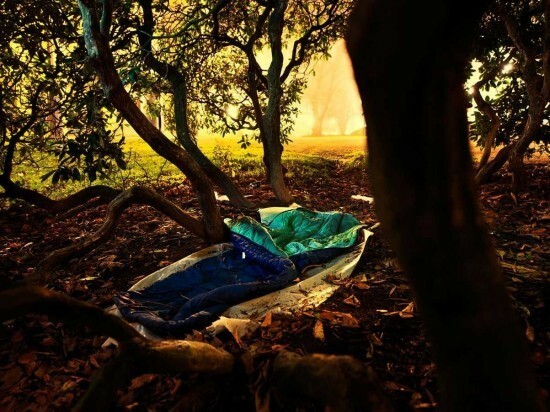 The idea was generated by Faktum's event manager, Sara Erkhagen, as a way to draw attention to the plight of the homelessness debate. The creative heads that brought Erkhagen's concept into fruition were ad agency Forsman & Bodenfors and Thomson Interactive Media in November 2012. “We don’t think politicians do enough. This is a reminder of poverty and a way to get involved in an easy manner,” Israelson told the Huffington Post. “There’s a lot of confusion and wrong ideas about who gets to be homeless and who is homeless. People in Sweden think that everyone that is homeless has a drinking or drug problem which is not the case,” he added. Roughly one out of every six homeless people in Sweden -- an estimated 3,400 people -- live in Gothenburg. While there are some social programs and shelters available, Israelson says people are definitely not happy with the way things are. "The most important thing is to take a look at what is going on around the street, to take a minute or a couple of seconds to look homeless people in the eye when you meet them in the street and just reflect." Or just book a 'room' down by the river for a night.